It comes in four sizes to ideally match multiple heights. And its foot has this sneaker-influenced grip surface, for maximum stability. There's also the Omhu cane, with multiple spinoffs of this original design from 2010, with rubber grips lining the sides of its wooden handle and similarly shoe-inspired foot, "made from hiking boot material." The tuxedo model is made of bicycle-grade aluminum, and its sport model is super lightweight, at only 9.5 ounces and supporting up to 300 lbs of weight with its rubber-dipped handle. And you can get a custom dock to hang it on the wall. More at Top & Derby and Omhu. 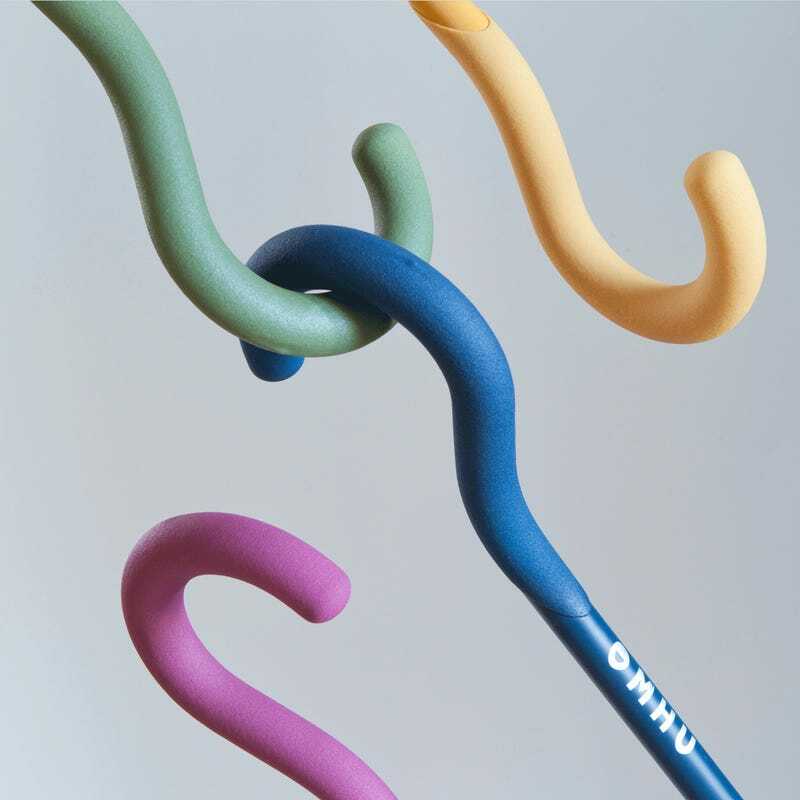 Images: The Chatfield cane comes in dark-stained wood, with its angular, silicone-grip handle in pale blue, black, or red. Its non-slip design makes it prop-able by either the end or side of the handle, and its foot, in the same color as the handle, features geometric cutouts, like you'd find on the bottom of a sneaker. The Omhu cane has a more classic c-shaped wide grip, with strips of rubber on either side of its top arc. Its wood is clear and unfinished, and its body comes in six bright colors. Its rubber sport model comes in several candy-colored pastels, monochrome. The custom docks come in orange, green, or natural unfinished wood, hanging like a doorknob on a wall.